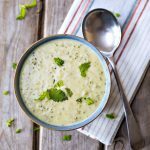 Broccoli cheddar soup is an all-time favorite. And it’s actually one of the most fun soup recipes to make. With just a little prep, you can use your CrockPot to make an entire pot of delicious homemade soup. The ingredients for broccoli cheddar soup are actually very basic and only require a little work to bring out all the wonderful flavors. Of course, one of the main ingredients fresh broccoli. You can use frozen broccoli if you like, but frozen broccoli can often have very few florets and lots of stems. By using fresh broccoli you can have perfect broccoli florets. And of course, it’s always better to use fresh when you have the chance. Another major ingredient in broccoli cheddar soup is sauteed onions. Place broccoli, shredded carrots and onions in slow cooker. Add salt, pepper and chicken stock. Stir well and set on high for 2 hours. After 2 hours, remove lid and stir everything. (Optional step) If you want, use an immersion blender and give it a puree for about 30 seconds. Slowly add small amounts of cheese and blend until melted. Do about 1/2 cup at a time so that it melts into the soup evenly. Adding large amounts at once can cause clumping and not melt properly. After all the cheese is melted in, leave in slow cooker on low for about 15 more minutes. Then, remove lid, stir in half and half, and you’re now ready to serve.